Victoria Glass transforms a classic roast chicken recipe into an easy summer meal, adding subtle spice with a Peruvian Amarillo chilli marinade and serving with a fresh, crunchy salad and creamy dip. Amarillo chillies are grown all over Peru and have a distinctive golden colour and slightly fruity flavour that pairs wonderfully with the tender chicken. There is no bigger crowd pleaser than a roast chicken. It is a simple, but oh so comforting, pleasure and one that absolutely anyone can cook. It may take longer than an episode of Masterchef to roast, but you don’t need to be a master chef to make it. Throwing a bird in a hot oven until the juices run clear and the salty skin goes crisp is something even the most unconfident cook can produce. The oven does all but a few minutes of the work for you. A chicken is delicious roasted au naturale, but sometimes it’s nice to be a little more playful with flavour. 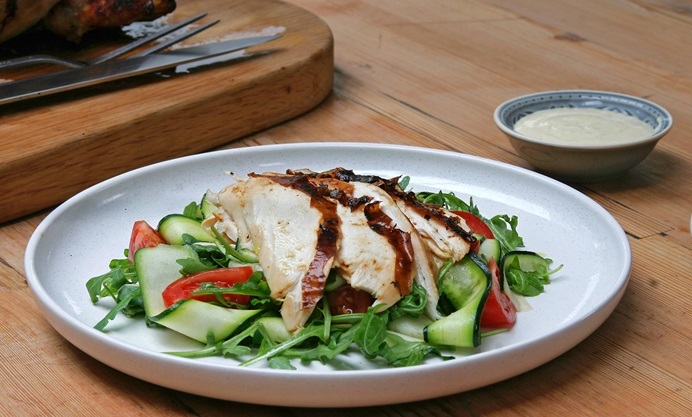 The Peruvian chilli sauce turns a traditional roast chicken into a summery show stopper. With a warming tingle of heat and an exotic sweetness from the authentic blend of Peruvian Amarillo chillies, a roast chicken is transformed from cosy to classy in the amount of time it take to open a bottle and pour. Warmer weather calls for salads over bread sauce and my quick and simple dipping sauce makes an impressive and summery alternative to gravy. So, chill the beers, dust off the deckchairs and relax: roast chicken just got a hot new make over.